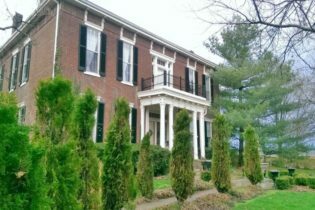 1851 Historic Maple Hill Manor Bed & Breakfast, Alpaca & Llama Farm, and Handcrafted Gift Gallery, located only minutes from Bardstown, is listed on the National Register of Historic Places and has been designated a Kentucky Landmark Home. Rediscover historical elegance from an era of refined romance and southern charm with spacious guest rooms that are antique appointed. offering large extra padded beds, designer linens, and private baths. Our premium rooms include a double Jacuzzi and/or fireplace. Due to the historic nature of the home and the comfort of all guests, smoking is only permitted outside the home. Relax at our peaceful, park-like setting. 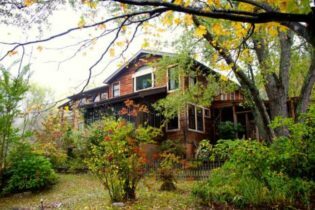 You will find double rockers on the front porch, garden benches, and a large patio area with tables and comfortable seating set among ancient maple trees. Stroll our flower gardens with Gazebo and multiple fountains and fish ponds, nature reserve, and orchard. Enjoy interacting and learning about our Alpacas & Llamas. Numerous bird feeders are located near the house attracting a variety of songbirds and hummingbirds. A picnic table and grill are available for guest use. Depending on harvest time, guests are welcome to pick from the 50+ orchard of apples, peaches, pears, cherries, and plums. We also grow grapes, raspberries, blackberries, blueberries, and an Herb Garden for Guest indulgence during breakfast. And of course, our official greeters and companion pets, Sophie and Sampson, our Golden Retrievers, are always available to you! Voted #1 in the U.S. as the B&B with the “Most Historical Charm” as well as “Best Breakfast in the Southeast” – by Arrington’s B&B Journal AND voted “Kentucky’s Best B&B” by readers of Kentucky Monthly Magazine. We look forward to your visit! A Storybook Inn is the oldest Select Registry Inn in Central Kentucky, the Horse Capital of the World. Though our guests come from all over the planet, we also count it a privilege to serve our local businesses and horse farms as exquisite accommodation for their overnight guests. The Bluegrass Country Estate Bed and Breakfast offers the perfect getaway just outside of LaGrange, Kentucky. The Bluegrass Country Estate Bed and Breakfast offers the perfect getaway just outside of the town of LaGrange, Kentucky. From the luxurious linens and splendid artwork to the workout and theatre rooms, our country manor estate features accommodations and amenities that were thoughtfully chosen for our guests’ utmost comfort and convenience. We offer plenty of options for relaxation; enjoy the country scenery on our porch, take a dip in the beautiful pool, relax in the hot tub or watch movies on the big screen while enjoying popcorn from our old-fashioned popcorn machine. In addition we have furnished our rooms with Scandinavian Sleep Systems offering a great opportunity for you to rest on the most sought after mattresses and enjoy a great night’s sleep! The horse barn is a great place to lodge your horses while traveling to horse shows or attending local events. It has 8 beautiful and comfy stalls and a wash bay. You can also take your horse out in the pasture so they can kick up their hooves and stretch those tired legs after being in the trailer. Welcome to the world's first bourbon-themed Bed and Breakfast! Charming Bardstown, Kentucky is not only the Bourbon capital of the world, it was also named the 2013 "Most Beautiful Small Town in America" by Rand McNally. Bourbon Manor is a reflection of Bardstown - quintessentially Southern and richly historic. It has recently undergone extensive renovations in order to provide guests complete comfort. The Inn features 10 spacious and elegant guestrooms in addition to a Honeymoon Suite and 2 separate guesthouses. 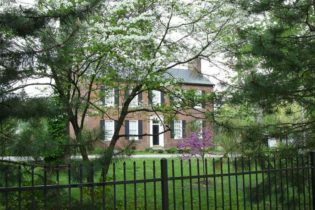 Bourbon Manor is conveniently located near the many Bardstown attractions and offers several VIP Bourbon Tour & Tasting Packages that can be added to an overnight stay. Plan your visit to a place where Bourbon is celebrated year-round – where we sip our Bourbon in grand Southern style. There is something for everyone here, every month of the year: My Old Kentucky Home State Park, Historic Trains and Museums, Civil War historical sites, Kentucky’s Wine Trail, and of course, the world-famous Bourbon Distilleries. Spring 2014 marks the opening of the Bourbon Lounge and Dessert Bar, which will feature many Bourbon-themed food items. Breakfast might be Bourbon Pancakes with hot caramel sauce, while dessert could be Bourbon Apple Cake, Bourbon Bread Pudding, or Bourbon Pecan Pie. Of course, there will be a wide range of Bourbon beverages available! We are also opening a Bourbon Spa with Bourbon-oriented treatments and an exclusive line of spa products. The inn is just one mile south of downtown Cincinnati near Newport and Covington, KY attractions, 20 minutes from Cincinnati Airport. Christopher's Bed and Breakfast has been voted by inn goers for three consecutive years as one of the Top 15 B&Bs for "Best Interior Design and Decor" in Arrington's Bed & Breakfast Journal's Book of Lists! A mile from Northern Kentucky’s bustling Newport on the Levee is Christopher’s Bed and Breakfast, a ravishing 19th century former church that sparkles with jewel-toned stained-glass windows, three sumptuous Jacuzzi suites and sits grandly in the heart of the Bellevue historic district, Taylor’s Daughters, in honor of General James Taylor. Named for the patron saint of travelers, Christopher’s was transformed from a place of worship to a place of winsome respite by the Guidugli family in 1996. Today, two junior Jacuzzi suites with queen-size beds, stained-glass windows, and private baths charm visitors. 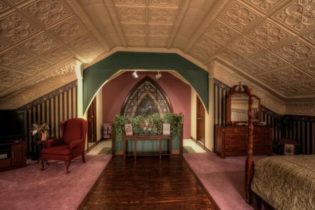 There’s also a luscious Governor’s Suite, radiating romance with its four-poster king-size bed, magnificent stained-glass window, cuddly living room, and two private “his and hers” half baths and shower, plus a two-person Jacuzzi that begs long massaging soaks beneath the room’s original pressed-tin ceiling. Christopher’s Bed and Breakfast has been voted by inn goers for three consecutive years as one of the Top 15 B&Bs for “Best Interior Design and Decor” in Arrington’s Bed & Breakfast Journal’s Book of Lists! Celebrate your special occasion (honeymoon, birthday, and anniversary) at Christopher’s Bed and Breakfast, for your perfect romantic getaway! First Farm Inn is an elegant, updated 1870s farmhouse 20 minutes from Cincinnati. A quiet refuge for two-and four-footed friends who enjoy tasty, healthy food, comfortable surroundings and warm companionship. First Farm Inn, a renovated farmhouse on 20 acres, is set just off Cincinnati’s belt line offering all the amenities of country living. Surrounded by pasture populated with a colorful assortment of friendly horses, the inn’s spacious rooms have queen-sized beds and private baths. Bountiful homemade breakfast options vary from breakfast casseroles to pasta carbonara or Swiss Rosti. Ride the friendly horses at First Farm Inn. Help groom, tack up and really learn to communicate with your new equine friend. Watch the sunset from our swinging teak bench by the riding arena. Midweek, multi-day discounts available Sun-Thurs, including horseback riding and/or massages. 15 minutes to Greater Cincinnati-Northern Kentucky International Airport. Paddle around the pond, or try your rowing skills. The big pond is stocked with bass. Perfect North Slopes Ski packages available Dec. – Feb. Just 10 miles away, enjoy relaxing in our outdoor hot tub after a day of skiing. 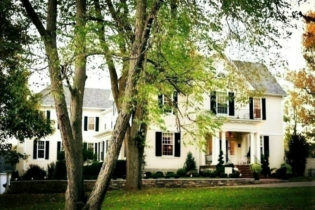 Come to the Lawrenceburg Bed & Breakfast located in beautiful Lawrenceburg, KY for an unforgettable getaway to the Lexington, KY area. 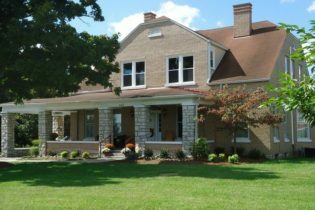 Welcome to the Lawrenceburg Bed & Breakfast located in Lawrenceburg, KY and close to all that the Lexington, KY area has to offer. The inn is conveniently situated at the center of the Bourbon Trail. 20 minutes from Lexington and 45 minutes from Louisville, KY. Stay where guests can experience and enjoy all of the sights, sounds, smells and tastes that are truly unique to the Bluegrass area. The inn offers two spacious and private king suites that provide a relaxing environment in a very comfortable setting. Each suite is uniquely appointed and has their own baths, Wi-Fi, heating and cooling controls. There is also a third room with Queen bed and Private Bath across the Hall. A delicious full breakfast is served each morning that can be enjoyed before exploring the many activities and attractions in Lawrenceburg and Lexington. 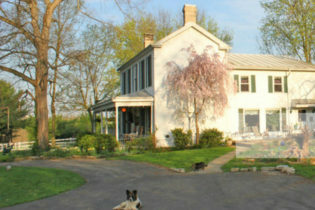 Welcome to Snug Hollow Farm B&B, a secluded 300 acre farm bed & breakfast nestled in central Ky near Berea. A haven for relaxation offering a perfect place for quiet overnight stays, workshops, retreats. Tour the Kentucky Bourbon trail or Kentucky wineries and retire to one of our peaceful accommodations featuring cottages, cabins and farmhouse rooms. We are the perfect place to experience the unforgettable magic of things still wild and roaming.Gourmet dining. Snug Hollow Farm Bed and Breakfast is a secluded 300-acre farm nestled in central KY. Our accommodations consist of spacious farmhouse rooms, cabins and a cottage with private baths air conditioning, gas fireplaces and grand views. The sitting room invites guests to read a book by the fireplace, enjoy our panoramic views, or walk our many trails. A guest favorite is the porch where you can catch a cool breeze and watch the wildlife. We were recently voted “1 of the 5 Most Romantic Getaways” of the South by Southern Living Magazine, and among the “50 Best Girlfriend Getaways” by National Geographic. The inn offers workshops, retreats and artist sanctuaries for those looking to rejuvenate their skills and senses. Dining at Snug Hollow Bed and Breakfast includes oatmeal pancakes with gingered bananas, cornmeal waffles and gourmet vegetarian dinners/lunches. If you like to explore, visit Berea, our local arts & crafts center, caves, the Kentucky Bourbon trail, Red River Gorge/Natural Bridge State Park or pottery shops. Escape to Weller Haus Bed, Breakfast and Event Center in Bellevue, KY, near the banks of the Ohio River and within walking distance to downtown Cincinnati. Romantic Suites, Gardens, Jacuzzi tubs and in-room breakfast make for a wonderful getaway. The Weller Haus Bed & Breakfast and Event Center, located in Bellevue, KY, is listed on the National Register of Historic Places and is within a half mile of the Newport Aquarium and just across the river from downtown Cincinnati, Ohio. You can enjoy a small town atmosphere while still taking in the nightlife of the surrounding area. Our 1880’s home is surrounded with gardens, water features, patios and fire tables. Three of our rooms are situated in the Trimbers House and two in The Weller Haus. Each suite or room is distinctly different and offers unique style and character. 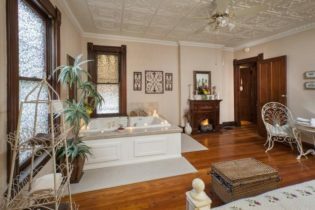 Complete with private baths, some include double Jacuzzi’s, and fireplaces. ALL of our rooms have heated mattress pads, flat screen TV’s, queen beds and the option of in-room breakfast. . Weller Haus has been guest approved as a romantic destination, a great one-night getaway, the place for a Cincinnati Staycation and an overall upscale B&B with upgraded amenities. Stay with us and find out what everyone is talking about!